Verizon is retrofitting millions of vehicles on the road by connecting them to the telematics network with Verizon Vehicle. 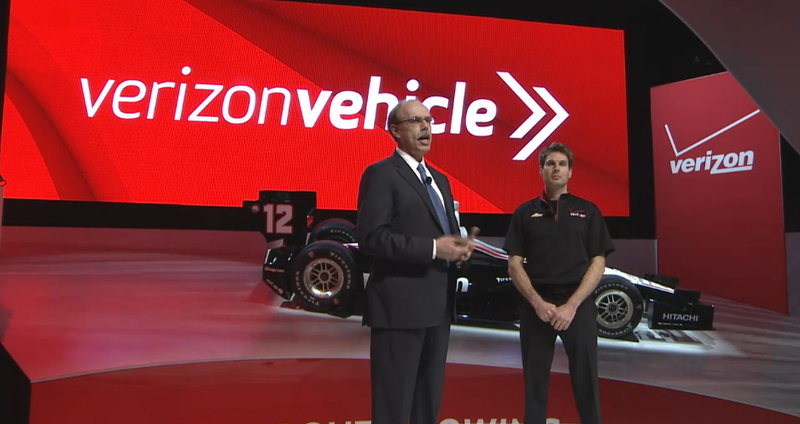 Andrés Irlando, CEO of Verizon Telematics, took the stage at the North American International Auto Show in Detroit, and after giving the customary rundown of how awesome Verizon is, Irlando and Telematics' President Erik Goldman finally got to the point. Verizon Vehicle is a subscription-based after-market service that provides near real-time diagnostics of your car, roadside assistance aided with GPS, and connections with car mechanics. The system works by plugging an OBD module into the diagnostics port, clipping a two-way Bluetooth speaker to your visor, and accessing data through a smartphone app. Throughout the short and horribly scripted presentation, Verizon went through all the features you'll be getting with Verizon Vehicle. This system will essentially take some of the guesswork out of why your check engine light is on and also help track down your car if you become the unfortunate victim of grand theft auto. Possibly the most useful feature is automated messages that let me know when I need to change my oil, an important piece of car maintenance I notoriously forget. Although the company does a lot of "revolutionary" posturing, Verizon's definition of a smart car is basically a service that gives awareness to cars that GM's OnStar service doesn't already have covered. Verizon lost its OnStar contract to AT&T almost two years ago, so it would seem that Verizon Vehicle is filling that void.